The view is of the sea and moonlight shining on the surface. In the centre of the picture is a Herring Drifter returning to port. The picture shows a view taken from the deck of another Drifter on the left of the painting. This is common theme in buckle's paintings of boats and many show the deck of the observer ship on the left hand side often with sails rigged. This composition technique was also used in scenes with building with the nearest painted on the left of the picture. 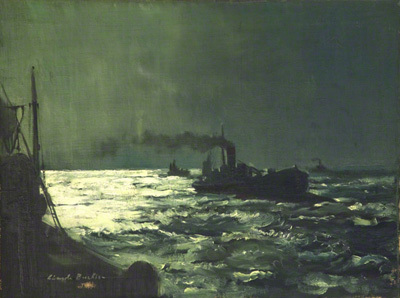 Claude Buckle in his oil painting captures the mood of the moonlit sea using a monotone colour of green to good effect.